Small semi-evergreen to evergreen tree. LOCATION: Canyons of the Edward’s Plateau and the cliffs near the junction of the Rio Grand and Pecos Rivers in West Texas. Grows in stream beds and likes rocky limestone soils. IDENTIFICATION INFORMATION: Texas pistache is a small bushy evergreen tree that has small leaflets, and is often a multi trunked plant. FLOWERS AND FRUIT: Clusters of white flowers are borne in the spring before the new leaves emerge. 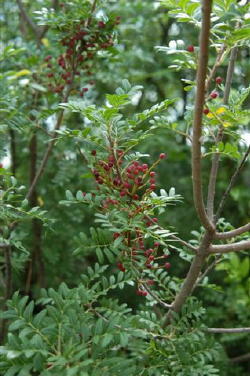 Sexes are separate on separate trees (dioecious). Fruits are single seeded, about ¼ of an inch long, start out red and turn dark blue or black at maturity. Fruit is an inedible nutlike droop. FOLIAGE: New leaves are reddish, later turning dark green and glossy, evergreen, 2 to 4 inches long, 9 to 19 leaflets that are ½ to 1 inch. CULTURE: Texas pistache is easy to grow in well-drained soil, is drought tolerant and needs a minimum amount of fertilizer. It needs protection in the winter in the northern part of the state. PROBLEMS: Will freeze in the northern part of the state in severe winters and does not like heavily irrigated or high rainfall areas. PROPAGATION: Can be grown from seed, planted immediately after collection in late August through September. It is beneficial to float the seeds briefly after harvest to separate the viable from the dead seeds. Fresh seeds will germinate quickly. Dried seed must be stratified for 30 to 60 days at about 41 degrees prior to sowing in the spring or in a greenhouse during the winter. INSIGHT: It has been reported that the Texas pistachio can be successfully budded onto the root stock of Chinese pistachio (Pistachia chinensis). This information comes from Howard's book Texas Trees click here to purchase.